A. 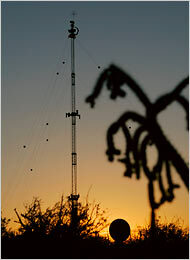 Currently, nine 98-foot towers have been installed along a 28-mile stretch of desert around Sasabe, Ariz., on the border with Mexico. The towers are to be equipped with cameras, radar and computer equipment, with data that can be accessed wirelessly. There will also be unattended ground sensors. The project's official name is SBInet. And the New York Times wrote a piece on the fence today, replete with great photographs, like the one attached to this post. I don't know yet if this is frightening or amazing. I'd like to see Bush and the Senate depend on "virtual" Secret Service agents. Funny how "virtual" protection is good enough for us -- but not good enough for them.